Quote From what I've read/heard the hooter and its article is mega old school and it's sorta written to sell sails...clearly. There's probably a very limited angle you can take that thing anyway and I'd be impressed if anyone has really put a new one on a boat in years. Most modern gennaker sails are realtively flat but not a on a 100 foot pole like the hooter. Just look at the F16/F18 boats. Yeah, I guess you're right.. a reacher at best. Mega old school ideas. What were we thinking putting a sail on the end of a 100 foot pole? BTW, Is that Rich Brew sucking on the water bottle at the Rudder Club in your photo? I would like to be able to sail more points in lighter conditions, pointing high as well as better downwind. It gets old just going back and forth across the lake between the same two spots. Also, sailing on an I20 with a spin was a blast, even in light wind. I'm used to dagger boards by now. I like the idea of the N17 because it is a lighter boat, with a lighter (CF) mast, and it's designed for a mixed crew. But, they're $15K+. I could probably find an F18 for much less. dssaak We have the same back and forth about rigging my Corsair F-242. The boat designer says you should be on the water 45 minutes after you pull up to the ramp. I have had the boat five years now and never have been under 1.5x that time but others have. Quote Before I bought my F16, I routinely rigged my Tiger (jib was already on the forestay) all three sails plus stepping the mast solo in less than an hour. Over the years I refined a process to where there was no wasted time and it worked for me. This was my first season with the F16 but with everything smaller and lighter, I have a target of 45 minutes for next season. I have no doubt I will get there even though the jib needs to be hanked on each time (no furler and I am not using the selftacker setup). Quote How close are you to upstate NY because next summer I could come out and show you my process. I stand by less than an hour including the spinnaker. You can find an older F18 for less certainly, but you are also talking about boats that are 15+ years old with associated wear and tear, plus outdated well everything. Not an issue for recreational sailing, but if you want to race, its an issue. Keep in mind a brand new F18 is $25-$27k without a trailer, beach wheels, hull chocks or any covers. A brand new N17 Mk. 2 is $35k, also without any of the above. These are performance race boats and as such carry a bit of a price premium. Part of that is also a result of lower demand in recent years, manufacturers have to amortize $50k + in tooling in some way. The Nacra 17 Mk. 1's are cheaper because the market has dried up. They are no longer class legal for the Olympics. They are also very squirrely boats to sail because they lack winglet rudders and therefore like to go down the mine or pop wheelies. The build quality on many is also suspect, even for club use you would be lucky to get 2-3 years out of one. Maybe 5 if you found a really high quality one (i.e Bora's). None of the Olympic sailors I have spoken with and/or sailed with liked the boat in its original form. The new Mk. 2's are much better built (all carbon construction), much safer to sail (far more pitch pole resistant), but they also carry an appropriate price tag and limited availability as initial production is all going to the Olympic squads. Also, the N17 carries the same sail area as a F18 and from all reports the sheet loads are higher than on an F18 because the speeds downwind are a bit higher, resulting in higher apparent wind speeds and higher loads. If you take a look at the winning female crews, they are closer to a wrestler in upper body form than anything else. PM responded to. 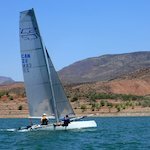 The Nacra Infusion F18 is a better boat than the Hobie Tiger, far more pitchpole resistant downwind and just smoother and easier to sail all around. 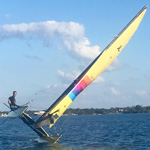 If you are targeting the $10k price range, you can probably get into a older Nacra Infusion or possibly AHPC C2 (https://www.thebeachcats.com/classifieds/catamarans-for-sale/p15269-2010-goodall-design-c2-f18.html , https://www.thebeachcats.com/classifieds/catamarans-for-sale/p14981-2011-f18-ahpc-c2.html). Infusion Mk. 2's go for more as they are held in a bit higher regard than the C2 but mostly as they are just less available. Thanks Sam, i have not seen any nacra f18's for the 4-5k range, I have seen some tigers. MN3 Thanks Sam, i have not seen any nacra f18's for the 4-5k range, I have seen some tigers. There will definetly not be a 2nd gen Nacra f18 for that price. There was a MKI for sale for san diego for $4,900 and was on this site and craigslist as of last week, but it might have sold as I cant seem to find it. Edit. Actually here it is for $5,900 but I saw it for 4900 on craigs before. Edited by Jonathan on Jan 05, 2018 - 11:54 AM. Good info Sam in your PM: exactly what I was looking for. It sounds like there were some build issues with early Nacra F18 Infusions, and possibly with the new 17's. I suppose that's to be expected, but I'd like to avoid those issues. I've read reports of weak hull seams in some of the NF18 Infusions - not good if widespread, and something to check when shopping. The C2 certainly sounds like a good boat, and I'm surprised to hear you say there are more of them available than the NF18 Mk2. I was concerned with parts and support, and expected a small number to have been imported. Any racing I do would be with a mixed multihull club, not specifically F18 since there aren't that many boats here. Monohulls and multihulls race together with a handicap (different start times). It's fun blasting past some high end mono's . Edited by ropewalker on Jan 05, 2018 - 11:04 AM. https://www.thebeachcats.…k1-f18-w-2f-trailer.htmlEdited by Jonathan on Jan 05, 2018 - 11:54 AM. That particular boat has been sailed to death and needs a new set of rags ($3500), the old set are completely shot even for club level racing. BrettEdited by ropewalker on Jan 05, 2018 - 11:04 AM. The seam issues only apply to Infusion Mk. 1's (basically 2006-2009 boats). Not all suffer from them, and its a relatively easily repaired problem by a competent composites shop or even home repair (I've re-glassed myself). The early N17's suffered from a lot more issues, I won't get into it here but Nacra was under intense pressure to get boats out the door for the start of the quad and hence there were a number of boats with issues. I've seen a number of early C2's also suffering from seam issues, the problem there is the bottom seam/overlap is narrow (1" or so), so beach launch/landings and lots of sailing in short chop fatigue the joint and eventually split it. The other thing with the early C2's is some were overweight. Red Gear Racing/Sun n' Fun is the U.S dealer so there is good parts support and availability; the reason the early boats are cheap is they brought a lot of boats in during 2011 and 2012 in the build up to Worlds. Some of the earlier boats also have short boards, the long boards are a direct swap but at a far penny, $1800-$2200 a set depending on year. Far less Nacra Infusion Mk. 2's were imported and they also don't suffer from any build quality issues from what I have seen. There are also modes where the Infusion is the faster boat, particularly downwind in sea state. In light air I might give the edge to the C2, but it really all comes down to the crew. Your biggest issue is going to be availability, there is a growing F18 fleet in San Diego/So. Cal so the cheaper boats are getting scooped up left right and center. Bringing a boat back from the East Coast is doable, more so probably after F18 worlds in Sarasota, FL this October. samc99us That particular boat has been sailed to death and needs a new set of rags ($3500), the old set are completely shot even for club level racing. Probably true, but to get a spin boat is what I was looking at in the 4-5k range. Not going to find any spin boat in that range with newer sails. Heck, i would assume his 18 has older sails then that one so it is a step up for that matter. That tiger you posted is decent though and worth a look at. Oh yeah, my jib is toast. The main is still crispy, but original. Uh oh, a dare. Dang it. .
Edited by ropewalker on Jan 05, 2018 - 02:50 PM. czbob75f BTW, Is that Rich Brew sucking on the water bottle at the Rudder Club in your photo? Guess I didn't post my response. I don't have one. I wouldn't single hand a spin boat. You could with the self tacker but then never hoist it. If anyone is selling their hooter setup I would very much like to buy it.